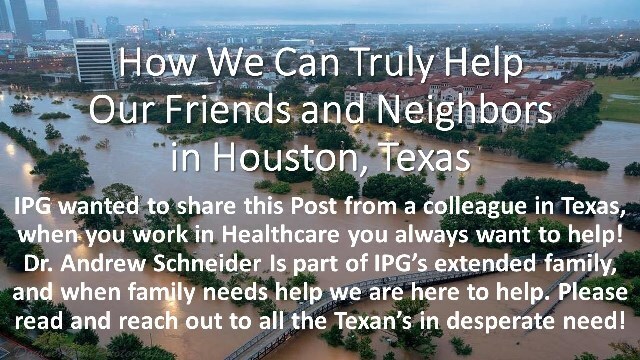 IPG wanted to share this Post from a colleague in Texas, when you work in Healthcare you always want to help! Dr. Andrew Schneider Is part of IPG’s extended family, and when family needs help we are here to help. Please read and reach out to all the Texan’s in desperate need! Houston and the surrounding areas are still dealing with the direct effects of Hurricane Harvey. While we often assume weather events covered on television are sensationalized, I assure you it is not. We saw swampboats up and down our street, helicopter rescues a few blocks away, and water rising all the way to the attics of the house. While my home and office was spared, many of our colleagues and their staff were devastated. In situations like this, we see how our professional community comes together. I personally have received texts and emails from all over the country asking how they can help. Right now, the most helpful items are gift cards. This allows those affected to take care of immediate needs as they care for their family and start to recover. Gift cards from Target, Walmart, Amazon, Lowes, and Home Depot are most helpful. I keep telling my family that we are the most blessed family in the city and that's not an understatement. I am focused, however, to work with our profession to help, even in a small way, to provide needed aid. I've set up an email address [email protected] to accept virtual gift cards to be distributed to colleagues and their staff in need. Physical gift cards can be sent to 1011 Augusta Dr. Houston, TX 77057. Please do not send any cash or checks. If you would like to help greater Houston, you can donate through national organizations such as the United Way (https://www.unitedwayhouston.org/flood) and the Red Cross (https://www.redcross.org/donate/hurricane-harvey). Houston and it's surrounding area thanks you for your prayers and support.